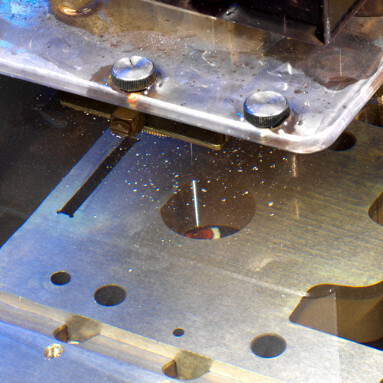 Special exterior coating on wire for electrical discharge machining (EDM) enhances the wire’s capability of handling higher machining power without breaking. Let’s take a look at the most common types of coated wire and compare their enhanced performance capabilities to standard brass wire. Here’s my take on the advantages and disadvantages of coated wire—plus how to justify the cost of coated wire operations. What Is a Coated or Stratified Wire? 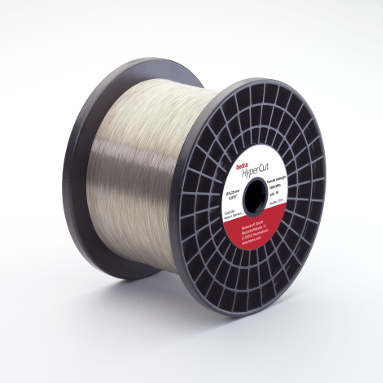 Coated wire has a special outer layer that enhances EDM performance. Coated wire contains either a copper or brass core. 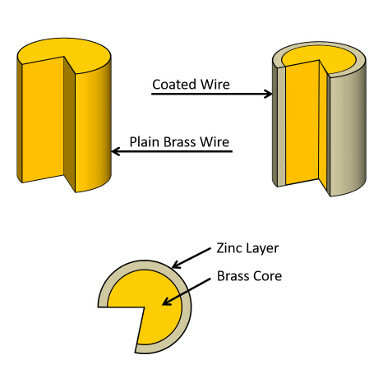 There are different types of coated wire, and while their coatings all involve a high-zinc-content brass alloy, the enriched zinc layer thickness and how this layer is applied to the wire varies by coated wire type as well as the wire’s intended application. The special outer coating helps to preserve the inner core of the wire. The outer layer vaporizes more quickly than the inner core due to the higher zinc content, protecting the integrity of the inner core and minimizing wire breaks. It is through this protection that additional electrical power can be applied to improve machining speeds without seeing an increase in wire breaks when compared to standard brass wire. What Are the Types of Coated Wire? 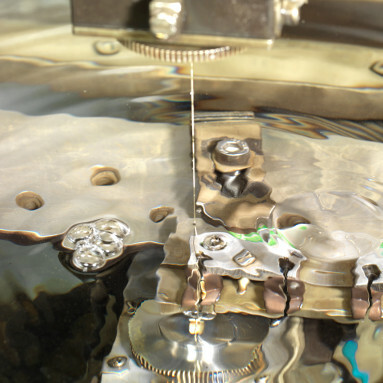 Type-A wire provides a minimal machining speed increase over brass wire, but it works more reliably with automatic wire threading (AWT) systems. Many EDM manufacturers recommend Type A to achieve the highest part quality and surface finish, especially on carbide materials. Type A, which as a distinctive, bright and shiny silver color that contains a single-layer of 110-percent Zinc coating, keeps the rollers and components of the machine’s wire drive system clean for reliable operation. Type-D wire increases roughing speeds by as much as 20 percent (or more), making it ideal for tall workpieces or poor flushing applications while providing the same level of surface finish and accuracy capability as standard brass wire. The coating on Type D contains a modified zinc-enriched outer coating to cut faster than Type A. The distinctive dark brown color of Type D wire results from an outer layer of 50/50 split of copper and zinc. Gamma-Phase wire can achieve cutting speeds 30 percent faster than standard brass wire. Gamma Phase is an excellent choice to improve cycle times for both good and poor flushing applications. Gamma-Phase wire sometimes exhibits excessive flaking or produces a powdery residue on the EDM rollers due to the dull gray or gray-gold coating’s relatively soft state. The AWT reliability of Gamma-Phase wire is slightly lower than that of standard brass wire. Coated wire can achieve cutting speeds 20 to 30 percent faster than standard brass wire, thus increasing productivity. Some coated wire can cause EDM machines to be less reliable. The potential for wire breaks is significantly reduced when using coated wire. Certain types of coated wire may degrade the reliability of an AWT system due to its different memory characteristics and tendency to flake or leave a powdery residue on components of the wire drive system, which can increase maintenance requirements. Operational profit can be increased when using coated wire. More machine maintenance is required when using coated wire. Less wire will be consumed per part. The purchase price per pound for coated wire is higher than standard brass wire. How Do You Justify the Higher Costs of Coated Wire? While the cost of coated wire is typically one-and-a-half to two times the cost of standard brass wire, coated wire provides a 20 to 30 percent increase in cycle times during roughing operations. That trade-off makes coated wire ideal for higher part volumes. Many shops take a myopic approach to evaluating the use of coated wire by following a thought process of “if coated wire costs twice as much, but doesn’t cut twice as fast, then it’s not worth using.” Although coated wire is more expensive, its higher productivity provides a greater billable shop rate, and almost always provides higher operational profit. Parts Costs $11 per lb. $60/hr 1,560 hrs. Whether you prefer the hourly shop rate or the per-part cost calculation, the bottom line is coated wire provides greater profit. Should You Use Coated Wire? If your workload is low, or you’re considering fine-skimming operations, use standard brass wire for its economy. However, if your workload is high or you’re considering roughing operations, use coated wire. The three coating types support greater machining speeds with fewer wire breaks. The potential to improve cycle times by as much as 30 percent will almost always offset the additional cost of coated wire. Learn about the latest developments and applications for coated EDM wires. Multiple types of coated wires will be covered, along with their performance differences to standard brass wire.